If you’re looking for one kitchen secret to get people begging for your most basic of recipes, it’s using seasoned salts. Anyone who’s ever watched a cooking competition show knows that salting your food is the number one rule in the kitchen. 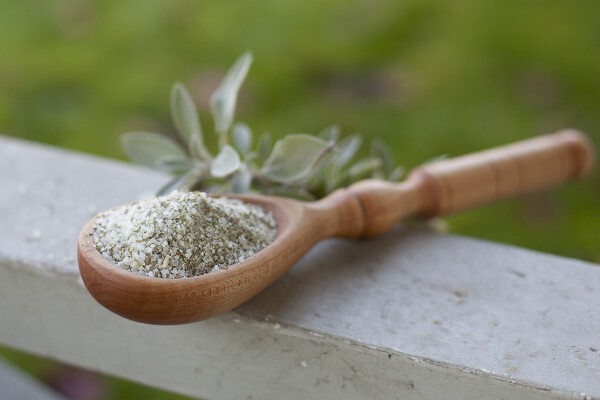 But grinding dried herbs with your salt creates a condiment with such depth, even you will wonder how your food can have so many layers of flavors. Companies like Herbamare figured this out ages ago, and there are all sorts of seasoning salts on the market. But homemade seasoning salts are really the way to go, because you control exactly what goes into them. Plus, it’s fun to have your secret ingredient be something that you actually created yourself! This is my version of homemade Herbamare, using several different herbs to create a homemade seasoned salt that can actually make plain old water taste like cooking stock. I’ve been using it nearly every day and it’s rocking my world right now! I sprinkled it on some chunks of roasted potatoes for a potluck, and had several people texting and emailing me for the recipe the next week. It’s that good. Oh, and if your looking for a Mops craft idea that’s not too artsy, or maybe you’re planning to host a DIY party, this is a great option. Just have a couple food processors, a bunch of different herbs, and a cup of kosher salt per person. As the Mops craft lady, I set this up for our most recent craft, and it was a ton of fun. People got to be creative and make their own flavors, or follow a few recipes I had available, and still have lots of time to gab away. I just provided cellophane baggies, some yarn to tie them, and paper to make tags. Everyone got to take home four 1/4 cup portions of seasoning salts that they could use or give away as hostess or Christmas gifts. I have a new favorite kosher salt that I found on Amazon. It’s fourteen pounds of salt for under $12, way cheaper than I’ve found anywhere else for a good quality Mediterranean sea salt. I also like that the texture is very coarse and crunchy. You need a coarse salt to make seasoned salts or it gets ground too finely in the food processor. So far I’ve used these on roasted potatoes, sweet potatoes, squash, pumpkin seeds, scrambled eggs, steak, in several soups, and even on my Thanksgiving turkey! What do you use seasoning salts for? 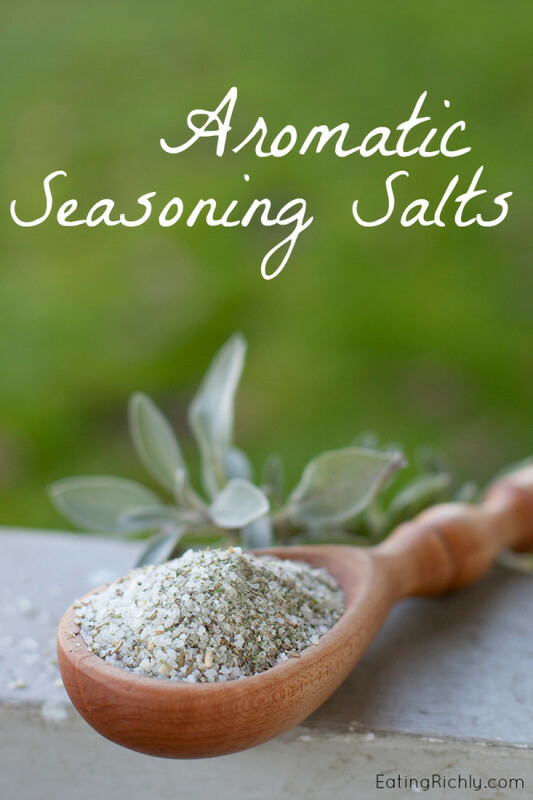 These aromatic seasoning salts are like a homemade herbamare, and will enhance the flavor of any recipe. Place all ingredients into the bowl of a food processor and pulse about six times, until well mixed. Approximate cost/serving: I bought my herbs in bulk from Amazon and Sam's Club because we had 60 women making seasoning salts. If you're doing this on your own, just get herbs from the bulk spice section, or get fresh in season and dry them yourself to save money. This cost me about 50 cents for one cup. Vegetarian/Gluten Free: Just make sure your ingredients don't contain any anti caking agents with gluten (especially the onion and garlic powders).